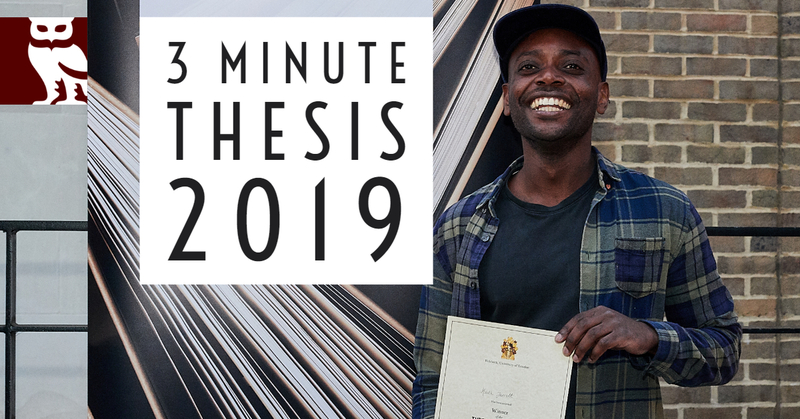 The BGRS is pleased to announce the 2019 Birkbeck 3 Minute Thesis Competition, which will take place on Thursday 2 May from 6pm. You are invited to mark this date in your diaries! The audience will also have their say by picking a people’s choice winner who’ll win a special prize. If you would like to join the audience please register here to attend. Following the competition there will be a drinks reception for all attendees. 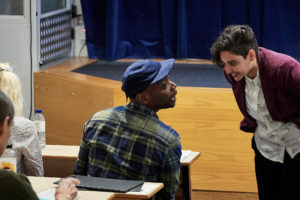 You can read more about what it was like to take part in the 2018 3MT competition in these BGRS blog posts from Cathy Rogers and from winner Keith Jarrett. 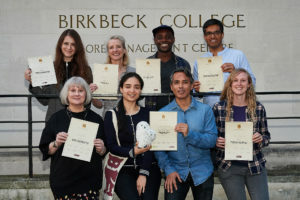 All potential competitors for the Birkbeck Three Minute Thesis Competition must attend one of the following training sessions – if you think you would like to compete this year, please do sign up. This training is provided by Birkbeck’s Public Engagement Team and will enhance your presentation skills as well as preparing you for the competition. 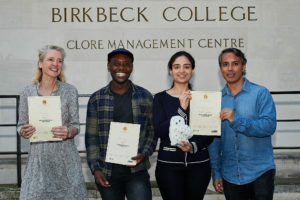 This is an international event and the Birkbeck winner will have the opportunity to continue on to the UK semi-finals later in the year. 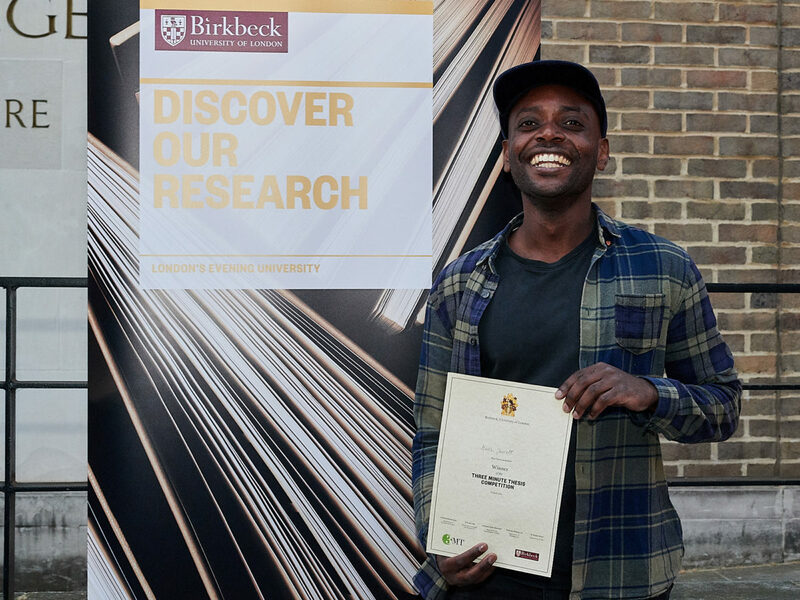 As one of the People’s Choice winners for 2018, how would you describe your experience of the 3MT event? It was tough! I had practised my speech several times, but once I was in front of the audience I got too nervous and started to forget some bits, so I had to improvise. I guess I wanted to sound calm but passionate about my work at the same time, which is always difficult to get it right. 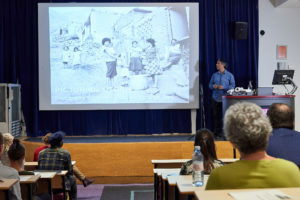 I am glad people in the audience got a clear idea of what my research was about (analysis of photographs taken by slum dwellers in Lima). Overall, the 3MT event was a good experience and very well organised, I can now explain my work in less than three minutes! 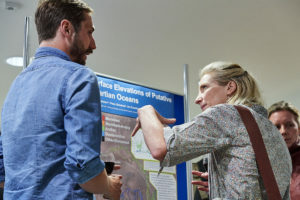 Did you submit a poster for the Poster Presentation, if yes/no what did you think of the posters? Yes, I did. I put lots of effort and creativity into the design of my poster. Coming from the School of Arts, I knew the standard format for posters was not going to suit my needs. The research poster structure is very much based on a cause-effect approach to the study of natural phenomena and social relations. I personally disagree with such positivistic model, even though I have a psychology and sociology background, so I wanted to tell a story in my poster in a way that could give viewers a sense of what it is that I am exploring, my findings so far, and the contribution my study makes to society. I anticipated most poster judges were going to be drawn from disciplines different to mine (visual studies), so I used some of the standard poster sections to keep it within the traditional assessment criteria. Sadly, I did not win, but many people complemented my poster highly, which is always a good indicator and rewarding of course. Would you recommend taking part in 3MT to other PhD students next year? Absolutely! If anything, it is a good opportunity to think about what you are doing in your research and how to best explain it to people who may not be familiar with your topic. Besides, you could win a good cash prize! 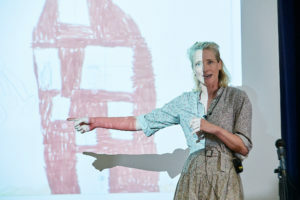 When I first heard of the Three-Minute thesis challenge, I had just entered the writing phase of my PhD after an exciting year of field work and was feeling as if I was losing steam. Having presented my research at a conference in the previous few months I realised the exercise was very helpful in refocusing my thoughts. Within this context the 3MT seemed like a much-needed opportunity to step back and regain some clarity and enthusiasm for my research. The first thing I did was look up the videos of past winners from Birkbeck and other universities. Although it seemed challenging to present three years of work in three minutes, I decided to participate because the PhD students looked like they were having a lot of fun. Indeed, the whole experience was hugely enjoyable, starting from the training workshop which was also a great learning experience. We learned ways to capture the audiences’ imagination, communicate our ideas quickly and clearly along with breathing and body language techniques. 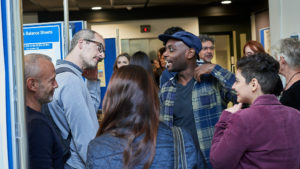 My favourite part was meeting PhD students from other departments and learning about their projects. Their passion and enthusiasm were infectious, to say the least and I felt energised and determined to give my best. The interactive nature of the workshop meant that we could test our presentation styles and get immediate feedback about what worked and what didn’t. 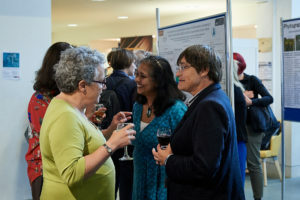 This camaraderie and infectious energy carried onto the evening of the challenge where I was happy to see so many presentations and posters on such a range of fascinating topics. The atmosphere was incredible with an almost full auditorium and a warm, cheerful and sporty audience. I was very nervous but the supportive atmosphere made me feel at ease and my nervousness melted away. It was an honour to be chosen the people’s choice winner. 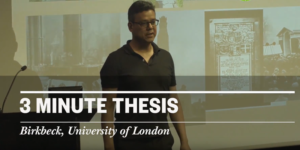 For me, the three-minute thesis challenge is all about connecting with the audience, communicating my research concisely and clearly and conveying the passion I feel for my work. I felt great satisfaction at achieving these goals and was delighted that the audience voted for me. I highly recommend participating in the 3MT to other PhD students as its not only a hugely enjoyable experience but is also a tremendously powerful exercise in honing presentation and communication skills and regaining clarity and focus. 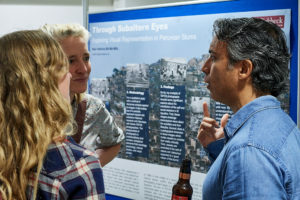 Raul (Department of Cultures and Languages) and Pavni Department of Geography) took joint place for the People’s Choice Award this year. 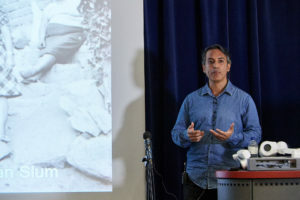 Watch Raul’s talk “Picturing Utopia: Photography against the odds in a Peruvian sunset” here. 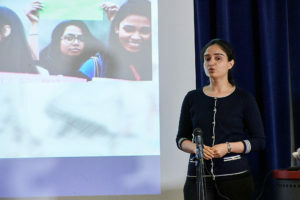 Watch Pavni’s talk “Looking beyond fear in Delhi: Mapping women’s everyday life” here. Before doing my PhD, I spent two decades working as a TV producer, with a particular interest in science programming, so over the years I interviewed a lot of scientists. They used to drive me nuts! They would be working on such interesting projects and seeing the world through a completely fresh lens – but they were often just awful at talking about their research, at least in a way anyone could understand. They were unable or unwilling to say anything with certainty, they always insisted more research was needed and in the worst cases they even wore their inability to ‘dumb things down’ as a badge of pride. So now I am on the other side. In some respects, I can appreciate more viscerally scientists’ stance. As you learn more and more about a subject, you appreciate more and more of its complexities and sometimes you feel you fully understand less and less. Saying things with certainty requires a 100% that science, with its 95% benchmark, will never (or very rarely (see there I am giving the caveat)) meet. But I still believe that if you can’t explain the essence of what you are doing and why you are doing it in a way that anyone interested can understand, then either you don’t understand it yourself, or it isn’t worth doing. To me, that’s what the 3 minute thesis competition is all about. Going back to the big questions of your research – why do you care? Why should anyone else care? And how are you going to go about inching forward knowledge with that bigger picture in mind. You can watch her full talk here. There is one question in particular I dread: What’s your PhD on? It usually follows the other eye-rolling what do you do? I know it should be simpler, much simpler; I know the person asking doesn’t want my life story; I know why colleagues make up answers at random, and I nearly always regret not making something up too, or at least having a more straightforward project. I sign up to the Three Minute Thesis competition mostly because I’ve been challenging myself do things I’m not comfortable with. 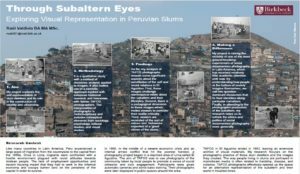 Explaining Oneness Pentecostalism and its migratory journey from the US via the Caribbean into London, and the subsequent effect on cultural and religious identity in the capital is one such thing. There’s jargon to unpick and I struggle to get to the point. The point I’m trying to get to now is that it takes effort to communicate succinctly, especially when you’re in the middle of a PhD that completely takes over your life. In the workshop, all participants are told to create a three-point story of our research. I listen to the fascinating work my colleagues are doing, colleagues who are also passionate, who also want to be able to share their world with wider audiences. I feel proud to be part of this community of student researchers. There are three whose work is so compelling to me – and completely unrelated to mine – that I read further about it. Later, at the competition, I see how they’d developed their stories into presentations, engaging with an audience who want to hear what they do, as much as I do. I was surprised to win, elated. I hope even more PhD students get involved in the competition next year. I recommend it for everyone, as we all need to be able to present in from of mixed audiences. I’m also looking forward to following the competition, looking at more of the other videos from participants around the world. 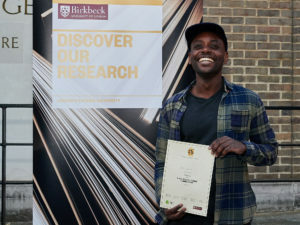 Keith (Department of English and Humanities) was named overall winner for his entry, “The migration of meaning: writing a new London Caribbean culture”. You can watch the full video for his talk here. 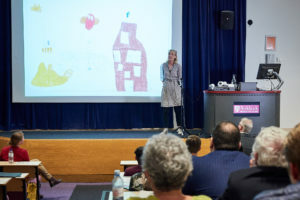 On Wednesday, BGRS hosted the second annual 2018 Three Minute Thesis and Poster Competition at the lecture theatre and foyer within the Clore Management Centre. There was a great atmosphere of interest, enjoyment and celebration among those who attended and took part. 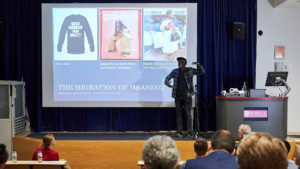 Keith Jarrett (Department of English and Humanities) was named overall winner for his entry, The migration of meaning: writing a new London Caribbean culture by the panel of judges, which included representatives from all five Birkbeck Schools. 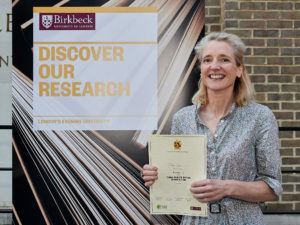 Cathy Rogers (Department of Psychological Sciences) was named runner up, for her talk Freedom and control: how do children achieve their creative goals? 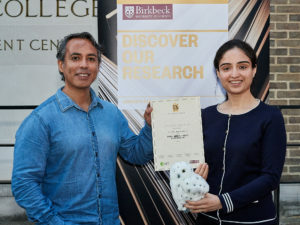 and Pavni Kohli (Department of Geography) and Raul Valdivia (Department of Cultures and Languages) were named joint winner of the People’s Choice Award for their talks Looking beyond fear in Delhi: Mapping women’s everyday life, and Picturing Utopia: Photography against the odds in a Peruvian sunset, respectively. 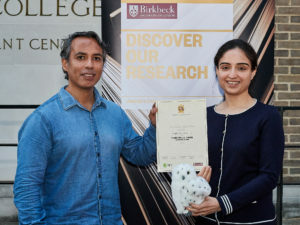 The Poster Competition was won by Ajitesh Ghose (Department of Psyhcological Sciences) for a poster titled Grounded Semantics: A Neural Network Approach. The full News Item for the event can be found here. Videos of the talks will be coming soon. In the meantime, you can watch videos from the 2017 competition here. The 2017 winner was John Siblon from the Department of History who received the £500 prize. 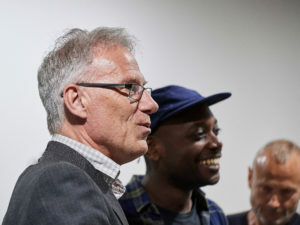 John’s research focuses on war memory and representations of black colonial servicemen in the aftermath of the First World War. 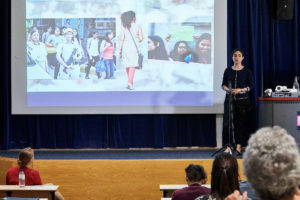 All current Postgraduate Research Students at Birkbeck are invited to take part in the 2018 Three Minute Thesis Competition which will take place on Wednesday 23 May. 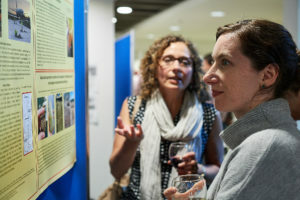 This year we are also holding a Poster Competition and a drinks reception on the same evening. We hope that running these two competitions will provide a fantastic opportunity to share the interests and successes of PhD researchers from across the College. Further information about how to register to attend of to take part is available here where you will also find details about training sessions available for those who are considering taking part. If you have any queries please contact graduateresearchschool@bbk.ac.uk in the first instance. A write up about the 2017 competition is available where you can also view recordings of each entry.